Got this lovely little Beaulieu 2008s off of ebay. 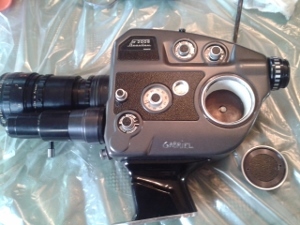 Trying to find batteries for the thing, and to my understanding it is an earlier "A" model because it has only 1 contact in the middle and one on the side for the light meter, instead of the "B" model which has the three pronged contact. It came with the 4 original 1.2v batteries, but no kind of battery container. From my understanding and the research I've done, the 2008 never came with a battery container, and all I need to do is find a set of batteries that fit inside the battery holder or hook up an external battery pack. If there's someone with the knowledge to tell me that I'm wrong or tell me how I'd hook up a battery pack for this I'd appreciate it, thanks. Thanks for the reply, but that doesn't really help me. 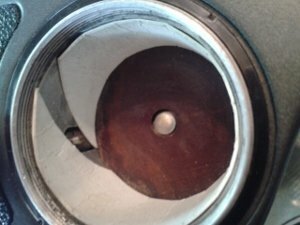 I know I can make my own battery solution for much less money than Du-All charges. The fact that it's not as easy doesn't scare me away. Then it looks really simple. 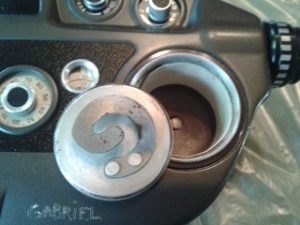 There's a tap on the side (that little spring tab) and one at the bottom (the center pin). The hardest issue is to cut in a thread. It's not going to be a standard size, so getting a tap isn't going to be easy. It would proabably have to be cut in on a lathe. If you don't mind destroying/repurposing the endcap, it should be fairly striaghtforward. 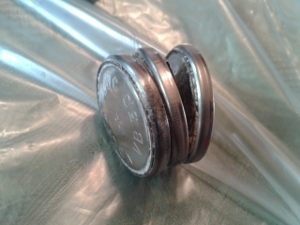 A metal sleave on the outside (with a lead soldered on) - the same diameter as the batteries, a plate on the bottom (with another lead soldered on), and an insulator to keep the two of them seperated. Drill a hole through the endcap, and pass through the two leads. then solder a connector to the leads (either inline with the leads or mounted to the surface - which requires a larger hole in the endcap). Match it to a 4.8V battery pack. The other option is that they do show up on ebay from time to time. I haven't seen one recently, but I used to see them for around $50. You can go to your local 3-D printer to print you a dummy battery to fill the void and give you two hard points for copper contacts. Fish your power line through dilled hole in the cap. And you're finished. So is the center Pin 4.8V, side tab 2.4, and side wall Ground? Or is the center tab 4.8V and the side tab ground? The center contact is 4.8v and the side contact is 2.4v, correct. I haven't used this camera in about a year since I have upgraded, however I did manage to obtain the dummy adapter for it, and there are two hot wires going to the center contact, each providing 2.4v, one hot wire going to the side contact which is 2.4v, and one ground wire which might go to the side of the battery compartment, not 100% sure. If you're building a pack from scratch, the later version of the 2008 or 4008 might be a bit easier because they have 3 larger contacts in the center that you can attach alligator clips to, one is 4.8, one is 2.4 and one is ground. A voltmeter is incredibly useful in these situations to double-check which is which. Sweet!!!! Thank you so much for the your. This definitely helps. I spoke with pro8mm. Theybdont work on these cameras so i figured i would confirm.